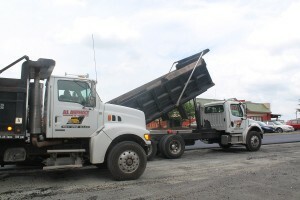 A1 Asphalt Paving & Sealing, LLC provides a full spectrum of asphalt milling services. Often times a parking lot will be beyond repairing with additional patching or may not have room for an asphalt overlay and will require milling of the deteriorating or damaged asphalt. Our experienced crews can mill your existing failing asphalt parking lot to a depth of 2″ to 18″ and repair any sub-base issues and re-pave back to the original new construction standards. A1 Asphalt can provide all milling and removal of debris from your site with our fleet and VDOT approved equipment. With the fleet we maintain, we can be re-paving the milled areas before the milling job is complete. 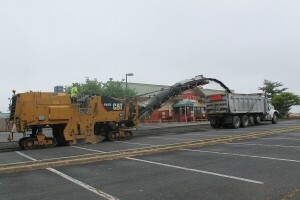 It is not uncommon for A1 Asphalt to be milling one section of a parking lot while another section is being re-paved. There are high traffic parking lots that we have milled, cleaned, removed debris and have the new asphalt being installed all at the same time. This ensures minimal disruption to your business operation. This performance is unparalleled in the Richmond and surrounding areas asphalt market. 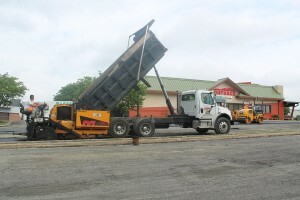 A1 Asphalt prides itself on this level of professional quality and timely asphalt services. Our milling and asphalt paving crews have extensive experience and can take on your next milling project whether it be for heavy duty traffic industrial jobs, restaurant establishments, banks, private roadways, condominium or apartment parking lots, etc. 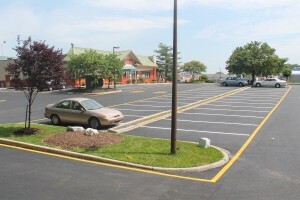 Contact A1 Asphalt Paving & Sealing, LLC today for a Proposal to have your parking lot milled and repaved. Please see our photos below of A1 Asphalt in action completing the milling and re-paving of an entire parking lot without the establishment having to close for business at all. We provide complete services to include all re-striping of parking lot lines and stencils to VDOT specifications and installation of all required ADA signage.